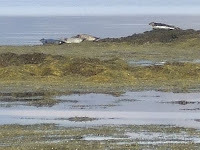 Yon Bill Bailey programme included a task where the teams had to paddle round Salen Bay in canoes, clocking up as many bird sightings as they could. Needless to say, we hadn't taken the canoe. Next summer, maybe. Once I've learned how to go it. Salen Bay was right next door though, and we were both awfy excited to notice that there were seals hanging around on the rocks a hundred yards or so beyond the wrecked boats in the bay. 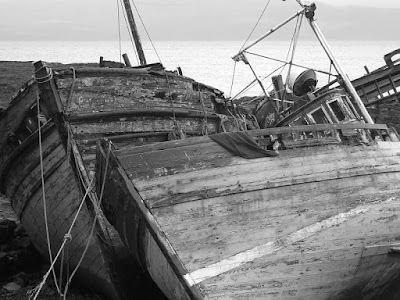 ...but the boats were a touch closer and more cooperative. 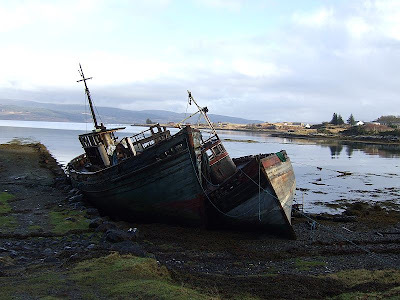 Later that day we headed south towards the Ross of Mull, for a wee change of scenery. It's quite isolated on the single track road beyond Craignure. We actually picked up a hitchhiker twice that day, a quiet French lassie who was there hoping to get work at the organic farm at Ardalanish. Now, on the way down, it was fair enough because she was on the wee road to the farm, and that was about 2pm when we were heading to Uisken Bay which is right next to it. 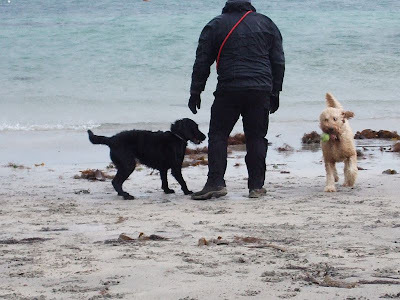 ( That attempted return visit ended in disappointment for us when it transpired that the majority of Mull's thousands of sheep live on the sand in the winter, and panic when they see cars full of labradoodles.) 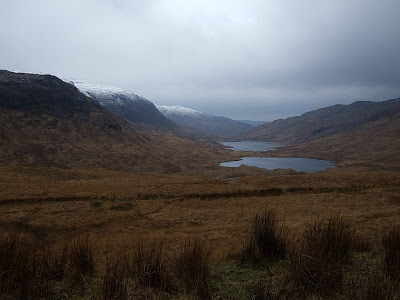 When we were heading home that evening though, we came across her again, walking in the road in the gathering gloom, on a stretch that was even more windswept and desolate than that photie near the lochs. 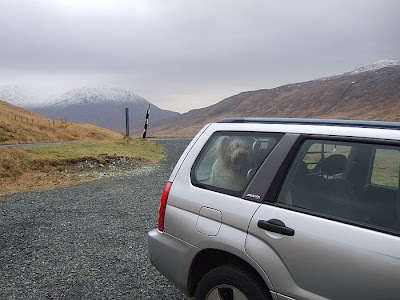 I think she was kind of fortunate that (a) anybody stopped & (b) it was us that did stop and we were happy to take her to the ferry terminal at Craignure. Seemed a bit of a bold plan for her, we thought. 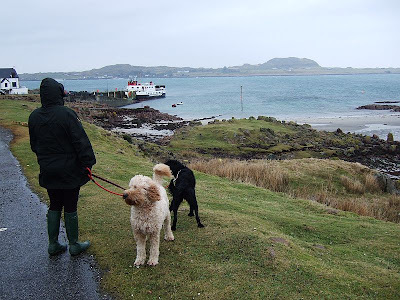 Anyhoo, the plethora of sheep at Uisken had meant a quick change of plan, and a visit to the patch of sandy beach at Fionnphort, just next to the slipway from whence the Iona Ferry leaves. It wasn't really beach weather, but we're hardy souls. Dugs make you that way. 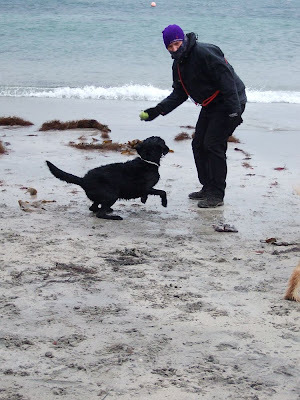 Molly & the Wee Black Dug were in their element. There's not a lot to the beach, but there's enough for excited dogs to let off a bit of steam. I know this photie's kind of blurry but I like the look in Molly's eye. 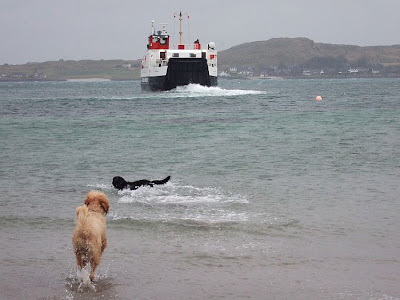 It was a fun afternoon, but ultimately the dugs were disconsolate when, despite their best efforts, the ferry left for Iona without them. Oh, and there were some deer looking at us on the way home. 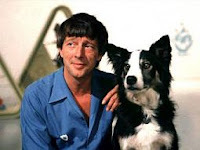 See, if we hadn't slowed down to try and take that picture, we'd have missed yon hitchhiker five minutes later. 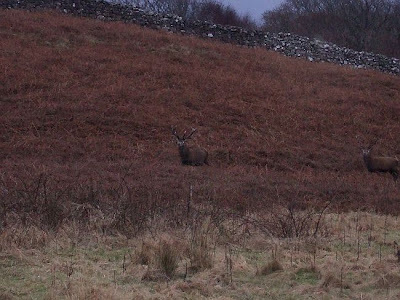 So it might be a crappy photograph, but it saved a wee lassie spending all night walking up a single track road in Mull. In January. Aye, it was great fun. 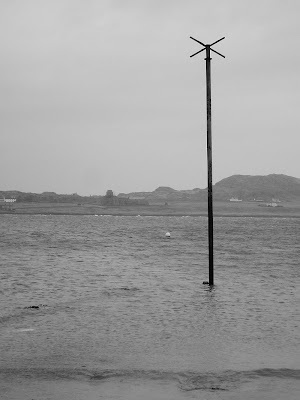 I saw that signpost for Pottie when we were on our travels that day, and thought of you. Well, some of yon photies you sent me anyway.